Looking how to get from Athens Airport to Patras in Greece? This travel guide describes how to get to Patras from Athens Airport by car, bus, train and even bicycle! I was recently asked how to get from Athens Airport to Patras by a reader. After answering them, I thought it would be a nice Greece travel article to add here. There are several ways of getting from the Athens Airport to Patras in Greece. You can drive, get a combination of buses, taxis and the suburban railway, or even cycle! Possibly the most straightforward way to get from the Athens Airport to Patras in Greece, is to rent a car. 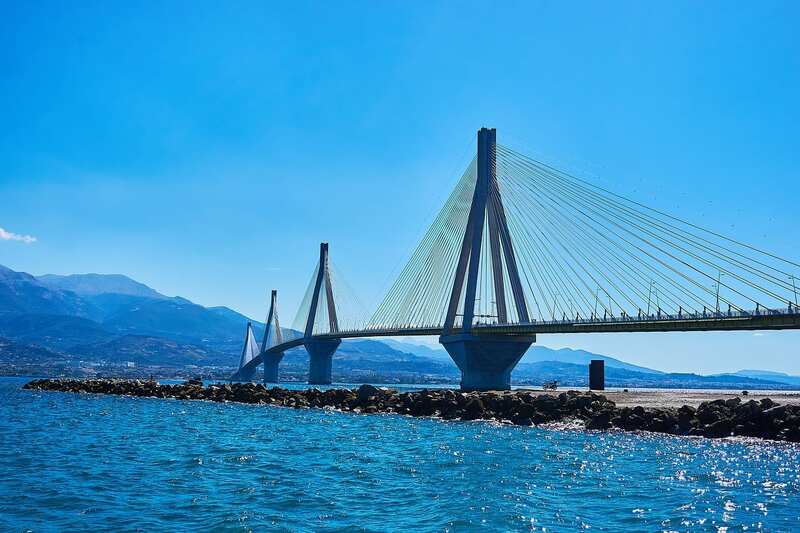 As the new highway connecting Athens and Patras has now been completed, the trip from the Athens Airport to Patras should take you about two and a half hours. Just be prepared to pay quite a few tolls – just over 14 euro. Is there a bus from Athens Airport to Patras? Yes there is a bus to Patras from Athens Airport. Kind of. It does involve changing though along the way. Option 1 – You can take bus X93 right outside the Aiport terminal. Allow plenty of time to get to Kifisos bus station, as it can take over an hour and a half or even more during rush hour. Tickets cost 6 euro – you can buy them at a kiosk just outside the bus and then validate them once on the bus. Option 2 – You can pre-book a taxi to meet you at the airport and take you to the bus station using Welcome Taxis. Once you have arrived to Kifisos Central Bus Station, you will need to find the bus going to Patras. Now when it comes to buses (and not only), Greece is a very unique country, as each area in Greece roughly has its own bus company. Those bus companies are commonly referred to as KTEL, but are all run individually. In order to get to Patras, you will need to look for KTEL Achaias, Patras being the capital of the prefecture of Achaia. There are buses every half an hour or so, so even if you don't have a ticket you should be ok.
You can use this link to check the bus timetable – Bus Timetable, or book a ticket in advance. Return tickets are discounted, but only if you book them in person. The bus will drop you off quite centrally in Patras, but depending on where you are staying in Patras you might need to take a short taxi ride. Note that if you are returning to Athens from Patras, you can get off the KTEL bus at Elaionas metro station and use the metro to go downtown. If you are a fan of trains, you can use a combination of the new and shiny suburban railway and a bus. You will need to take the suburban railway from the airport to “Kato Aharnai” station, and then switch to another train that will bring you to the town of Kiato. In Kiato, you will need to hop on a bus to eventually get to Patras. While there are fewer trains per day than KTEL buses, this route is more scenic, and you will avoid traffic in Athens. If this is your chosen means of transport, bear in mind that the train company goes on strike now and then. If you are planning very much ahead, you will be glad to know that the train is scheduled to go all the way to Patras as of 2022! Yes, you can even cycle to Patras from Athens Airport. It will take a couple of days though. The best way, is to leave Athens Airport and head to the centre of Athens. Just set you Google map on your phone to avoid tollways and a route will present itself. There may be a bit of dual carriageway riding at the beginning. From here, it might be good to stay overnight in the centre of Athens. After a little sightseeing in Athens, you could then follow the old highway 1 toward Patras. This take you along the coast, and once out of Athens itself, is quite a pleasant route. You can read more about part of this cycling route from Athens to Patras here – Cycling Athens to Messolonghi. If you're looking what to do in Patras when you arrive, I've got a great article for you. 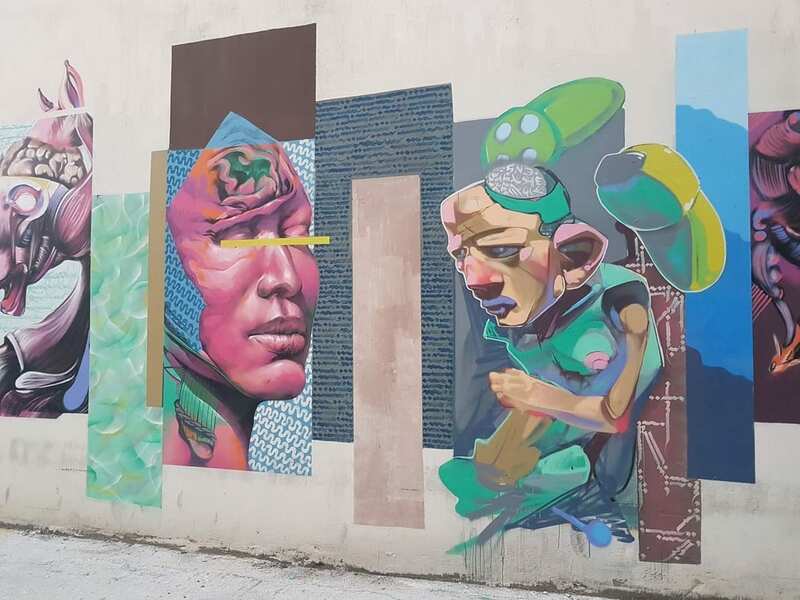 I'd certainly recommend checking out some street art and the museum in Patras. Take a look at the full article here – Things to do in Patras.